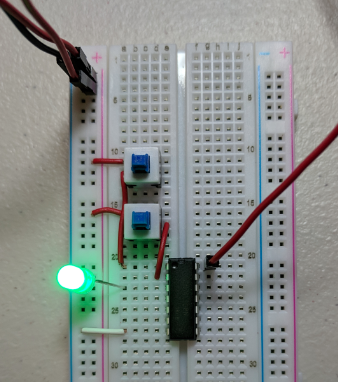 I have a very simple circuit on a breadboard with two push-button switches, an AND gate (74LS08), and an LED. I have the two switches hooked up to pins 1 and 2, while the LED goes from 3 to ground. Pin 14 is given 5 volts, while pin 7 goes to ground. I'm just trying to test to see if the AND gate works and so far it seems as though it doesn't. As soon as I plug in 5 volts to pin 14, I get current through all the output pins, 3, 6, 10, and 13, regardless of what's going on with their respective input pins, even if pin 7 isn't grounded. Obviously, the LED should only turn on when both switches are switched on, but once 5 volts is supplied to pin 14, it doesn't matter what I do to the buttons. I've tried a couple of the same AND gates from the pack, as well as some OR gates, and they all do it. It would help if you had added a schematic, but from what I can see, you are missing one vital component. A pull-down resistor. What this does, is it makes sure that the inputs are at 0V when there is no voltage present at the input. Once the button is pressed, you will get your 5V and when both buttons are pressed, you get 5V at both inputs. As it is right now, your inputs are 'floating' which means they are in a state that is unknown, which the IC could determine as a '1' state, which is why your LED is always on. This will also be why the same is true for all outputs. 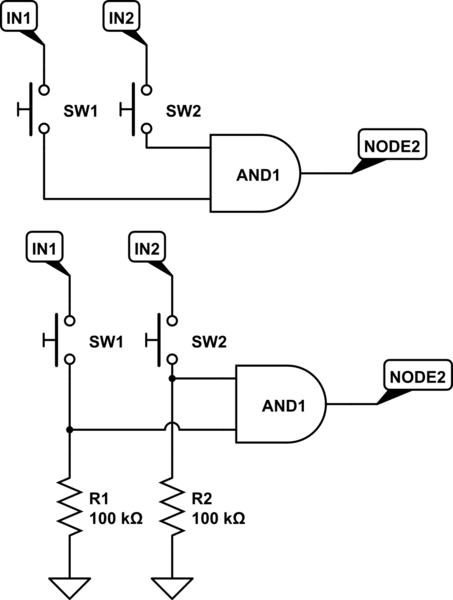 With these ICs, you should always tie unused inputs to GND via a pull-down resistor. Look at the above schematic. The top one is how I see your configuration at the moment (please correct me if I am wrong). 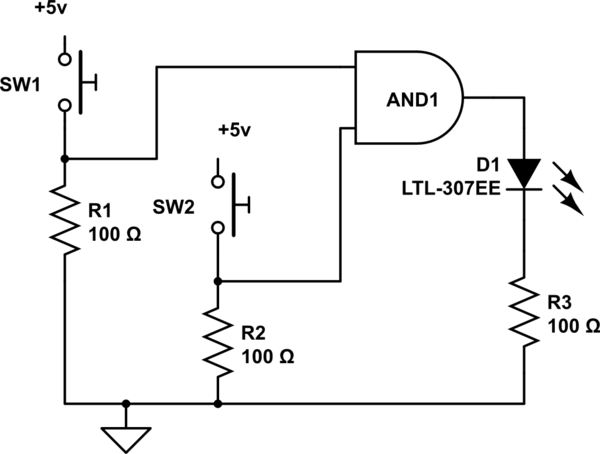 When there is no voltage applied to the input, it is left with a floating voltage and may not be at 0V. The bottom one is how it should be. Some pull-down resistors will ensure that when there is no voltage present at the input, they will stay at 0V. Add these resistors and you should see your problem go away. The inputs on bipolar TTL families (74xx, 74LSxx, and others without a "C" in the middle) will source current - when left unconnected they will act as a logic High. For the 74LS family, you have to draw about 0.4 mA from an input for it to be recognized as a logic Low. Traditionally, we would put switches between the input pin and Ground to ensure that the input could be pulled low enough to be seen as a Low, and add a pull-up resistor from the pin to +5V to ensure that the input would be High when the switch was open. If you want the switch between the input pin and +5V, you would need a pull-down resistor under 2000 Ohms to ensure the input was Low when the switch is open. This is because your circuit never put entries to 0v (entries of the gate). you have to use pull-up/pull-down to manage signal on entries of the gate. the output of the gate changes. TL;DR: Separated from 5V by a simple switch EQUALS "pin not connected" DOESN'T EQUAL "no voltage applied" DOESN'T EQUAL "logical 0". An unconnected input of a true TTL chip (74xx, 74Sxx, 74LSxx) behaves as if it is connected to 5V DC, whereas on a CMOS chip (74HCxx, 74ACTxx, CD40xx), it behaves as if it is connected to 5V AC. In any case, unless your LED has a (rare) built in current limiting resistor, YOU NEED ONE. Not the answer you're looking for? Browse other questions tagged logic-gates breadboard or ask your own question.